Water flosser or oral irrigator as it is commonly known is a device that can be used in place of regular dental floss. Flossing is good for your teeth but it can be time consuming and if you travel frequently, you don’t have to leave your oral care routine. Brushing alone does not guarantee healthy teeth and you need to floss daily to maintain your teeth and gums. Gurin Professional Rechargeable Oral Irrigator Water Flosser with High Capacity Water Tank is one of the best oral irrigator available in the market and the price is affordable. The oral irrigator is free from BPA and has been approved by FDA. This makes it completely safe to use by adults and children. Always choose a reputed brand so that you get value for your money. Depending on the type of oral care you prefer you can choose from three different modes of operation. The pulse mode of operation is used to massage the gums whereas the soft and normal modes of operation can help remove any kind of debris between the teeth and below the gums. The nozzle tips are coded in two colors and can be interchanged easily. The two-color coded nozzle is best if there are multiple users. The 360° rotating nozzle can be easily removed by pulling it straight up. The nozzles need to be replaced every 6 months. The product has a one year warranty. Before you buy any product, it is important that you weigh the pros and cons, so that you can choose wisely. Clean teeth and promotes healthy gums at a reasonable price. The water reservoir is large compared to other models in this category. Powerful long lasting rechargeable batteries. Cordless design enables better cleaning. Good for cleaning braces and dental implants. Massages gums in a comfortable manner. Lightweight makes it easy to hold and handle for a longer duration. Even though the water reservoir is large for a portable model the stream of water may not last as long as the counter top model. Mouthwash cannot be added to the reservoir. The device is not completely waterproof. Some parts may need to be replaced after 3 months. If you want the water flosser to last long, you need to clean and maintain it at regular intervals. This can help extend the life of the device and provide you a better experience. Wipe with a clean cloth and liquid soap to remove dirt. Use a dry cloth to wipe off. Wash the nozzles carefully and them wipe them dry with a clean cloth. Dry the device before storing. After use you need to empty the remaining water from the reservoir and drain it completely. Wash the water suction tube and wipe with a dry cloth. Avoid using vinegar to clean the device and use only water and natural cleaning agents. The Gurin Professional Rechargeable Oral Irrigator Water Flosser with High Capacity Water Tank has a lot of offer at an affordable price. The ease of use and long life powerful batteries and universal voltage are features that make it a valuable addition to your oral care routine. If you want to keep your teeth clean and gums healthy, it is best to opt for a water flosser. If you are confused with the many models available in the market, read reviews so that you can make an informed choice. 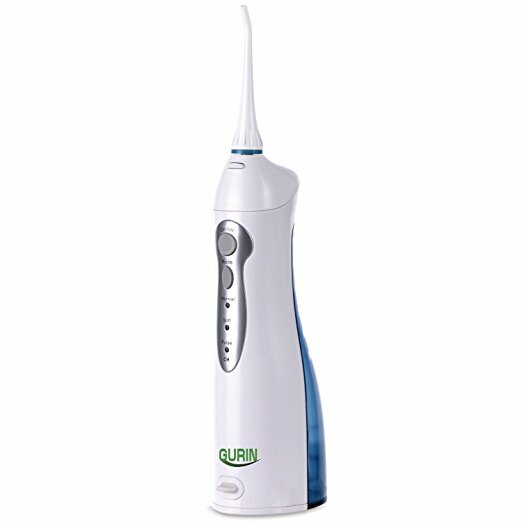 For more information about Gurin Professional Rechargeable Oral Irrigator Water Flosser with High Capacity Water Tank you can contact Gurin Products at (888) 666-1557.